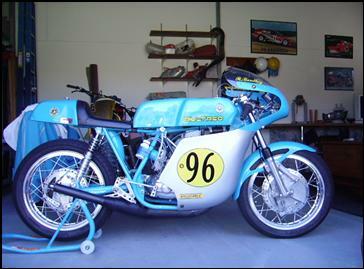 In my younger years, my first serious motocross bike was a Bultaco Pursang 125, Mk 6. The bike was excellent and I competed in some dirt track and a little bit of motocross. Eventually however the Mk 6 was replaced by 76 CR125 Honda, as was the trend beginning with Japanese machinery at that time. After a few more years campaigning the Honda, life changed so I gave up the bikes for many years. Eventually I got back into the saddle on a second hand Suzuki RM400 which was and still is a serious weapon. Sometime in the early 90’s I began to become interested in classic road racing, both as a result of being in the middle of a Matchless G-9 Twin restoration with my father, and after seeing some club racing at the Lakeside circuit. After that I met some of the people involved and hence joined the QEMSC Club. At first I did not actually have a suitable bike to ride and was given the opportunity to ride a Period 3 AJS 350 which was actually owned by the club. Despite the fun of riding at the lakeside track, the AJS was not particularly competitive so I sought to build my own bike and get a little more serious. 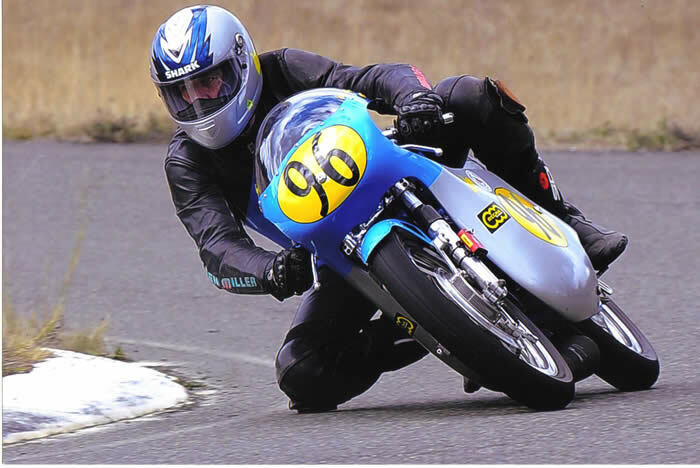 My past affiliation with Bultaco machinery, tied with the fact that other club members such as Rob Olsen were racing Bultaco’s as well, was what helped my decision to pursue a Bultaco 250 road racer. The Bultaco Company had long since closed its doors (1981) and parts were no longer produced. However the availability of spare parts for Bultaco’s is relatively high compared to many other Marques and I was soon able to piece together a Pursang frame, 250cc engine and the rest was essentially Pursang, including the forks and swing arm. With technical advice from others and previous experience the bike got moving and after a few rides and bit of fine tuning the bike actually became quite fast. After a couple of years, and with my skill becoming a little better and overall interest in the sport growing, the bike was becoming competitive. 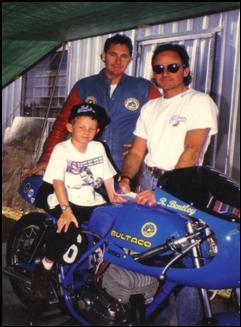 In 1995 I entered the Australian Historic Road Race Championships at lakeside on the 250 and finished 4th in the 250cc class, although I had the great pleasure of being sought out by the late Barry Sheene who upon seeing the Bultaco approached and asked a few questions (as an ex Bultaco rider). That year he had flown out to the track (Lakeside) in his personal Helicopter. After more years on the 250 and many races including a rather unsuccessful trip to Phillip Island, I did manage to secure 2 Queensland Championships (1998 and 2000) and had many great races with some much bigger bikes at times. 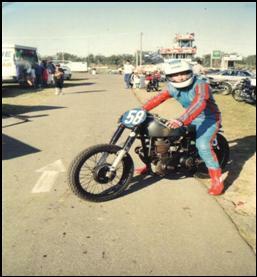 With the unfortunate closure of Lakeside and the move to Morgan Park at Warwick and Carnell at Stanthorpe, I continued racing the 250 with success. However the lack of power of the 250 at both Lakeside and Warwick tempted me to build a newer larger bike with some more horses. I chose to stay with a Bultaco which I loved to ride, so my only real option was a 360 engine and hence begin the newest project. The bike is essentially the same as my 250, however I decided to be more serious about the 360, the 250 involved some lucky guesswork at times but with some experience and more knowledge I was able to be pretty certain with the 360’s design. The frame is once again Pursang with minor modifications to suit road race shocks and different foot pegs. The Engine is a 360 motocross engine carbied and jetted to suit road racing. As stated, the engine is relatively standard apart from apart from a specially made inlet manifold, fed by a 38mm Amal mk2 and an expansion chamber supplied by Ginger Molloy. The ignition is a Suzuki internal rotor type which seems to help the engine spin up better. The overall look of the bike is similar to that of a period Bultaco TSS production road racer, thanks to a TSS fairing and a modified glass Yamaha tank. At first I opted to go for a period Suzuki Disc brake front end, however the disc was not as expected and after a few runs I opted to return to a drum brake. The brake I selected is a period spec 230mm 4 leading shoe brake which is similar in design to a Fontana unit, although make by Smith-Kanrin in Japan. The suspension and wheels of the bike are as follows; the forks are standard Betor forks which have been shortened a bit internally, the rear shocks are Falcon alloy units. Rear wheel is a TZa Yamaha single leading shoe drum laced to a WM3 flanged Akront alloy rim. The Front rim is a WM2 flanged Akront alloy rim, and both wheels are running Dunlop TT900 tyres which have proved very successful. I have attempted to keep the bikes weight low and wherever possible there are alloy parts. The bike looks great and is now quite competitive; I have had some good battles at Morgan Park in many different classes, most recently in the Bears Formula 4 class where the bike was good enough to beat some larger modern bikes. The 250 and even more so the 360 handle great and are a testament to how well a garage project can create a competitive racer capable of challenging production racers. 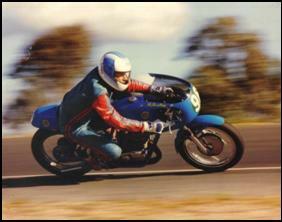 The bikes most recent success is 1st In the Period 4 up to 500cc Queensland championships which is a great result. Overall both the 250 and the 360 have been great bikes and hopefully prove the worth of Bultaco machinery in classic racing circles.